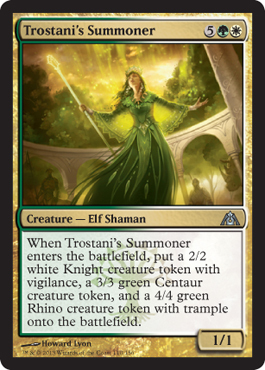 We've got more cards, as well as a preview of promos and tokens. So let's get going! Apparently I can't get them sideways anymore... Or I'm too lazy to try and find them... Armed gives a creature +1/+1 and double strike. 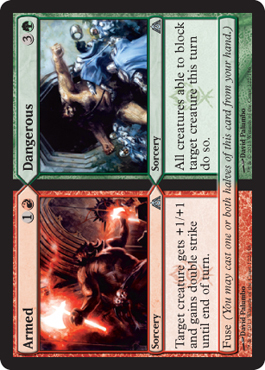 Dangerous makes all creatures capable of blocking target creature this turn to do so. Not bad. 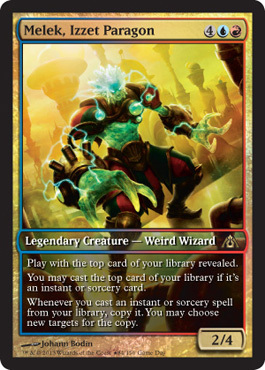 Definitely will fit well in a red/green deck for sure... Especially with Fuse. 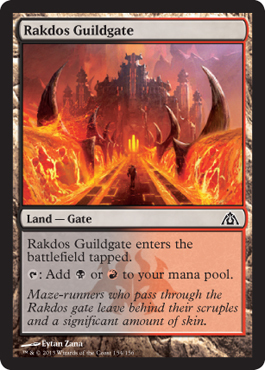 And with that, we have the Rakdos Guildgate art now in the card frame. 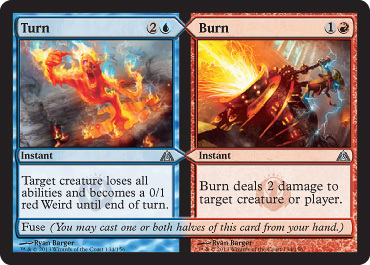 The next split card is Turn/Burn. 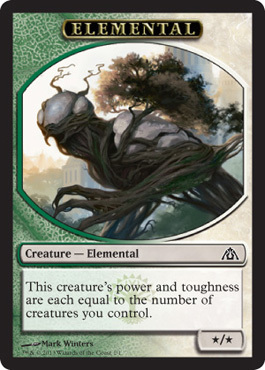 So you can make a creature a 0/1 Weird creature with no abilities until end of turn (reminds me of Turn to Frog from M12), and you can deal two damage to target creature or player... 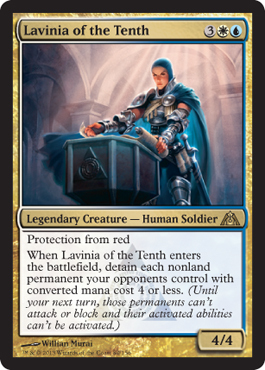 If you ask me, this is a good counter to Lavinia. Take away the protection from red ability, then burn her. Another guild champion! 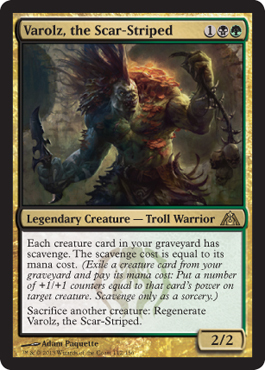 We have Rakdos, Orzhov, Izzet, Azorious, Simic, and Gruul, so now we have Golgari. 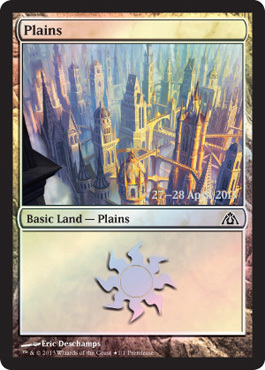 This leaves Boros, Dimir, and Selesnya remaining. This is just... this is just powerful. 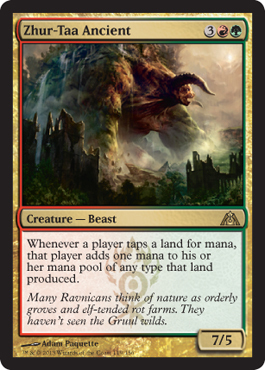 Three mana for a 2/2 that gives all of your creatures scavenge for the same cost as their mana cost. And then you can sacrifice a creature to regenerate Varolz, the Scar-Striped. So far, he's one of my favorites, I think. Six mana for a 6/4 that at the beginning of each end step, each player discards their hand... Picture this: Zhur-Taa Ancient, Varolz, and Sire of Insanity in one deck. Aside from the mana costs that get in the way, it'd make a good combo. 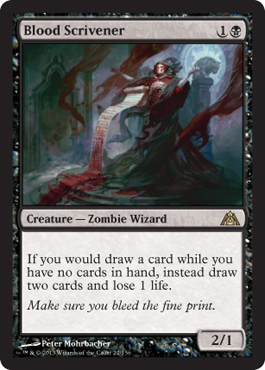 Maybe in EDH/Commander in a Jund deck. Everyone gets a Maze's End. 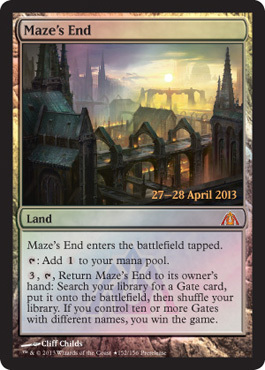 The Plains is what everyone gets for participating in the Implicit Maze. Breaking/Entering is the release day promo... 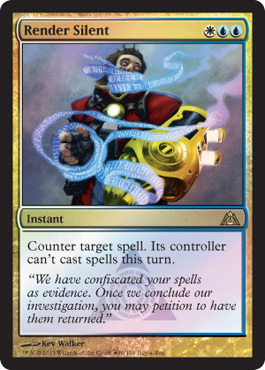 Breaking is a great milling card, and Entering isn't too bad either. Bit high of a mana cost. 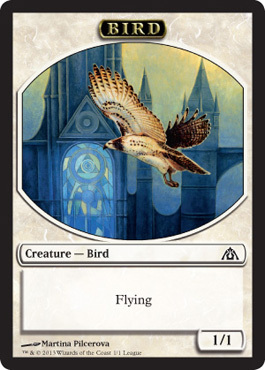 I'd probably only use this in a blue/black mill and only use Breaking... Or use it in Commander/EDH. Buy-a-Box Promo. Already went over this. 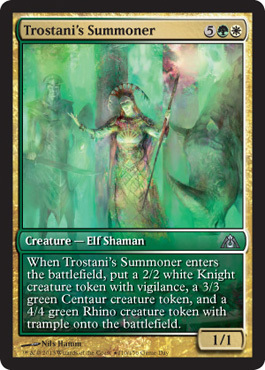 Full art Trostani's Summoner is what everyone gets for Game Day, and Top 8 get Melek, Izzet Paragon.